Daniel Ortega, leader of the Sandinista National Liberation Front Nicaraguan (FSLN) and former President of Nicaragua, has won the election for President outright with 38 percent of the vote in the November 5 elections. His closest rival was US–backed Eduardo Montealegre of the National Liberal Alliance, on 29 percent. Among the many messages of congratulations that poured in was a phone call from Venezuelan President Hugo Chávez. "Congratulations to you, to the Sandinistas and to all Nicaraguans. 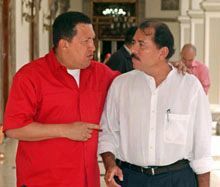 We are very proud of you … a Bolivarian and Sandinista hug to you all", said Chávez. Former KGB Up To Its Old Tricks?